We’d love your help. Let us know what’s wrong with this preview of Countdown by Carol Fiore. Polar ice caps are melting. Whole ecosystems are being destroyed. Wildlife is being carelessly slaughtered. Eighteen-year-old Skye Van Bloem didn't create the environmental crisis facing our planet, but she’s angry about it. What upsets her the most is that with the exception of her two best friends hardly anyone else on Earth seems to care. But Skye's about to discover that she's not alone. A race of technologically advanced aliens called Beholders have offered the animals of Earth a chance to determine the fate of the biggest threat facing the planet: humanity itself. According to an unlikely emissary from the animal world—a snarky prairie dog—only Skye can convince them that humans can change and start protecting the environment instead of destroying it. Now, nothing is as it seemed. As Skye’s adventures take her from the mountains of Colorado to the forests and fiords of New Zealand, she’s not sure who she can trust—her own grandmother, new friends, strange animal guides, or the handsome Beholder who just might be in love with her. But Skye’s biggest worry is herself: can someone as skeptical of humankind as she is become their greatest champion? Enter for a chance to win a copy of the young adult book named to the 2019 Green Earth Book Award Long List, which honors children's and young adult l Enter for a chance to win a copy of the young adult book named to the 2019 Green Earth Book Award Long List, which honors children's and young adult literature that promotes environmental stewardship. The author gives a majority of book proceeds to nonprofits, as her protagonist would want. Eighteen-year-old Skye Van Bloem didn't create the environmental crisis, but she might become our planet's greatest champion. Join her and her friends on an exciting adventure around the world to save the unique biodiversity of the animal kingdom. To ask other readers questions about Countdown, please sign up. Countdown by Carol Fiore is a fun, wide-ranging book aimed at teens and young adults. Filled with environmental themes, it does as many engaging fantasies do: dance from high-stakes but fantastic adventures to very human, painful episodes and back again. Beyond the adventures though, it does prod at deeper questions of how one lives. 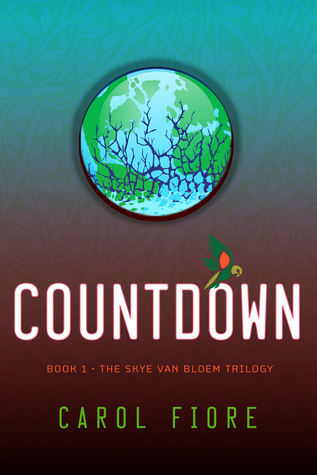 Laced with environmental themes, the protagonist must rise to the mortal thereat present by the plot while coming to terms the greater, real-world threats presented Countdown by Carol Fiore is a fun, wide-ranging book aimed at teens and young adults. Filled with environmental themes, it does as many engaging fantasies do: dance from high-stakes but fantastic adventures to very human, painful episodes and back again. Beyond the adventures though, it does prod at deeper questions of how one lives. Laced with environmental themes, the protagonist must rise to the mortal thereat present by the plot while coming to terms the greater, real-world threats presented (similarly to the background theme or rising authoritarianism presented in Harry Potter and the Deathly Hallows). It is clear that great care has been put into the work. From the unforgettable characters of Rob and Coorain to the vivid scene of the animal conference and the attention to scientific accuracy, it is a very lovely read. I can't remember when I last enjoyed a teen fiction book so much. Perhaps because hidden among the adolescent and animal characters are important messages - about the environment, about animals at risk, and about the mess we've made of our Planet. And also about concrete ways we all can improve the world. Plus - who can resist an endangered polar bear named PBJ?! I am already looking forward to the second book in this fun trilogy. My friend's mom wrote this book and I'm a sucker for young adult fiction so I gave it a read! Countdown has a really unique premise and an unpredictable plot, which made it a page-turner. There were lots of conservation messages weaved in throughout the book and even a surprise romance! This is the first of a trilogy so I'm interested to see which direction the next book goes in. I loved this book! The main character, Skye, is someone we would all be lucky to have as a friend. The characters (human and non-human) are relatable and interesting. With a timely message and page turning plot I would recommend this as a fun read for anyone, young or old. I look forward to the next book in the series! This is book is great for teens and tweens (others). The author teaches about environmental crises without preaching. The characters are intelligent and caring. There is romance, adventure, intrigue, and more. I highly recommend this book, I am waiting for the second. This book reawakened my commitment to recycling and to be more thoughtful of my purchases. I also found the characters highly appealing and the read was very enjoyable. Will recommend to my friends. Great book! Very enjoyable - well written, wonderful chatacters, and an unique plot make this a fun read. I highly recommend it and can’t wait for the next one! Talking prairie dog? I had hoped for something I could teach regarding climate change. Great Read! I really enjoyed it. Good for young adults. It illuminates the negatives of hunting and not begin good neighbors on earth to other species. It also demonstrates the effect of Greenhouse gases on the planet and environment. Carol Fiore holds three university degrees and is a licensed pilot. She donates most of the proceeds from the sale of "Countdown" to environmental charities. She maintains a scholarship which sends kids to Space Camp, in her husband's memory; read about him in "Flight through Fire." Inform Carol Fiore holds three university degrees and is a licensed pilot. She donates most of the proceeds from the sale of "Countdown" to environmental charities. She maintains a scholarship which sends kids to Space Camp, in her husband's memory; read about him in "Flight through Fire." Information on book signings can be found at Carol's website.